Hitachi has announced it will suspend work on the Wylfa Newydd nuclear power station in Anglesey due to the economic unviability of the project. The Japanese firm has also withdrawn from a second plant at Oldbury in Gloucestershire. Despite the British government previously offering £5 billion to keep the project going, a Hitachi spokesperson has stated that due to a failure to reach an agreement on the future of Wylfa with the government, the firm will suspend the development of the plant for the foreseeable future and will soon be taking steps to reduce their presence in Anglesey. This decision follows the collapse of another UK nuclear power plant last year, as escalating costs led to Toshiba similarly withdrawing from the planned Moorside nuclear power project in November. As CND has long argued, the increasing failure to find investors willing to prop up the UK’s nuclear power plants demonstrates the economic absurdity of the government’s continued championing of nuclear power. With renewable energy sources like offshore windfarms at their most competitive yet – offering cheaper energy prices than nuclear with the same energy generating capacity – this latest blow to the construction of new nuclear plants reiterates the lack of an economic case for new nuclear. In addition, many links persist between the nuclear power industry and Britain’s nuclear weapons system, Trident. The collapse of Wylfa confirms the government must now turn towards more cost effective, safe and viable renewable energy sources. 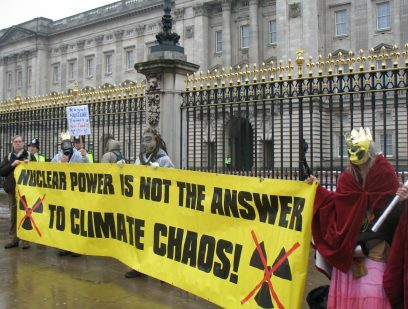 Join CND and urge the government to say no to nuclear power.